Animal abuse, cruelty and neglect are often considered isolated incidents wholly separated from other forms of family violence. Today, professionals involved with victims of family violence are not surprised when they learn that often these acts are linked, and that various agencies are working with the same families. They no longer excuse animal cruelty as “boys will be boys” or “it was only a cat.” Instead, they see animal abuse as a sentinel indicator, “the tip of the iceberg” and often the first sign of other family and community violence. Intentional abuse in any form should be taken seriously. Knowing that there is a Link, agencies involved in preventing family violence need to work together for a more effective, species-spanning response. Domestic violence and child abusers may kill, harm or threaten animals to exert dominance and power over their victims and to show them what could happen to them. In this way, animal abuse silences domestic violence and sexual abuse victims, is a serious risk to pets, and is a significant barrier that prevents them from leaving violent relationships. 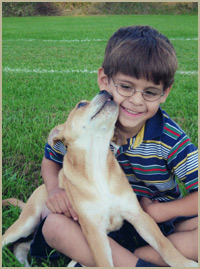 When children are cruel to animals it is not necessarily an exploratory stage of development; it could be the earliest stages of conduct disorder, a gang initiation ritual, an act of revenge, peer pressure, or a way for an abused child who feels powerless to exert control over his or her own victim and gain a sense of power. Exposing children to animal cruelty may desensitize them against all forms of violence. Senior citizens in particular may be at risk of not being able to care for their animals adequately, of neglecting themselves in order to care for their pets, of being exploited by those who would take advantage of their attachment to pets, or of keeping too many animals in inhumane hoarding conditions. What are the effects of animal abuse? In addition to causing pain and suffering to the animals, animal abuse can be a sentinel indicator and predictor — one of the earliest ”red flag” warning signs of concurrent or future violent acts. Abusers and impressionable children who witness or perpetrate abuse become desensitized to violence and the ability to empathize with victims. Abuse is often cyclical and inter-generational. The earlier professionals can intervene to break the cycles of violence, the higher the rate of success. Why should social services professionals pay attention to animal abuse? Victims are often reluctant to talk about abuse that has been directed at them, but they may be more comfortable talking about abuse to their pets, which can then break the ice about discussingt their own abuse. Neighbors are more likely to report suspected animal abuse than child welfare, domestic violence or elder abuse cases, thereby making their local humane society, SPCA or animal control agency a “first responder” and the first point of social-services contact for a family in crisis. Children who talk about having many pets that died or disappeared may be trying to say that their pets have been killed or abused, and further investigation is necessary. Offenders often do not see animal cruelty as a serious crime and may readily admit to animal abuse but not to family violence. This may be one way to put an offender away where he will not hurt others. Professionals in law enforcement, social service agencies, education, human and animal health care, and the courts should recognize animal abuse as a significant dynamic in their work and routinely screen for animal welfare issues. They can partner with animal care and control agencies in concerted, collaborative prevention and intervention programs. Through educational programming and public awareness about The Link, these groups try to intervene before violence begins or escalates. Community presentations, special events, humane education in schools, programs in universities, and in-service training to professionals are building awareness and developing effective organizational strategies. Awareness of The Link is encouraging many agencies to seek cross-training so they may build local networks and report other forms of suspected abuse, knowing that they may also be preventing other forms of violence. When any form of family violence is suspected, the appropriate agency should be informed so its experienced personnel can evaluate whether a further investigation is warranted. Women’s shelters are forging partnerships with animal welfare groups to provide foster care for the animal victims of domestic violence, thereby enabling battered women, children and pets to leave abusive relationships earlier. Many pioneering domestic violence shelters are building animal kennels within the shelters themselves to keep family survivors together. Human services personnel who work with abuse victims are screening for animal abuse by asking questions about the presence and welfare of companion and farm animals on crisis lines, in intakes, client assessments, interviews, and other places where this information can be highly revealing. State laws against animal cruelty have been toughened and now widely include felony provisions based on research indicating the risk to human safety that animal abuse can cause. Many states now allow judges to include pets in protection-from-abuse orders in domestic violence hearings. Academic journals and textbooks in child welfare, human-animal studies, sociology, child development, criminology, psychology, social work, veterinary medicine, and many other disciplines are now publishing compelling research describing The Link and its many manifestations. These reports are making their way into mainstream media to increase community awareness and build additional credibility for the ways that animal abuse, domestic violence, child maltreatment, and elder abuse are often interrelated. Animal abuse is now recognized as part of a continuum of family violence with serious implications for multiple victims and society. 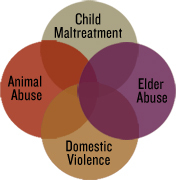 Acknowledging The Link between animal abuse and domestic violence, child maltreatment and elder abuse provides professionals with an important tool. By working together, professional and public awareness will be raised which, in turn, will lead to safer and healthier communities and more effective programs.